It’s that time of year again—the time when we dig into our collective search conscious to capture the spirit of the times. We’ve gathered the most popular and fastest rising queries from a number of countries for 2011 to give you a glimpse into the hottest trends and topics from the year and around the world. And this year certainly wasn’t lacking in events, people and moments to captivate our attention. This year in Thailand, searches brought us together in a battle against flood waters and a shared desire to find information to protect our loved ones and our livelihoods. Thais searched for creative ways to survive and thrive in our economy, from online job applications to the latest lottery results, and our searches helped us create deeper and broader connections with each other through social networks and online communities like Facebook and Google+. When it comes to amusing ourselves what do ‘itchy ears’ and ‘eating liver’ have in common, they are the two surprise search terms that shot to the top of online charts as the most popular entertainment searches of the year. In the IT and technology space, the most searched for gadgets were smartphones or tablets from the rumoured iPhone5 to the Samsung Galaxy and Blackberry, and Thailand’s obsession with the red feathered Angry Birds continues to rival gamers anywhere in the world claiming the number one spot in online game searches. The 2011 Year-End Zeitgeist offers a unique perspective on the year's major events and hottest trends based not only on searches in THAILAND, but also searches globally. This year, our top searched global terms truly reflect the spirit of the times with the overnight internet sensation Rebecca Black taking the top spot and 東京 電力 (TEPCO, owners of the Fukushima Daiichi power plant), becoming the first non-Latin term to ever make our global fastest-rising list as well as the newest tech gadgets and social networking sites. 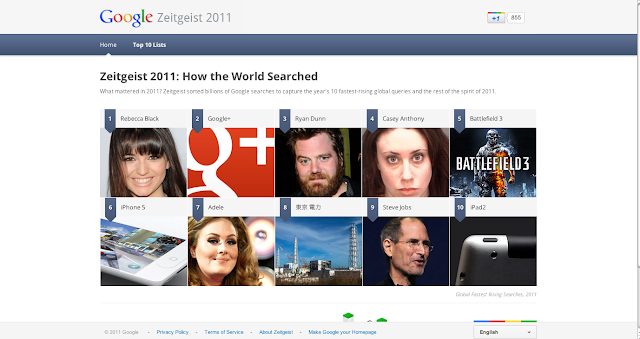 Beginning today, you can head over to our Year-End Google Zeitgeist website, http://googlezeitgeist.com/ to see the top global searches of 2011, and additional top in over forty countries. This year, we’ve made it easy to compare any top term from a country to one another and see how they change over time. The new, interactive format makes it easy to see how some of the world’s biggest events were represented through search or see which celebrities were most popular in each country. We created these lists and graphs using a combination of several tools that give insight into global, regional, past and present search trends on an aggregated level. Google Insights for Search, a publicly available tool that displays relative search volume across geographies, time periods and queries, informed many lists and graphs found on this year's Year-End Zeitgeist page. With billions of searches conducted globally on Google each year, there are a plethora of search trends based on location, season, vertical - and our Year-End Zeitgeist cannot possibly capture them all. If you want to come up with your own lists or graphs, we encourage you to play around with our public Google Insights for Search tool to generate your own "Zeitgeist" lists for 2011. Thanks to everyone out there for searching on Google - and here's to more searching in 2012!